Summer is still in full swing at the farm – this week’s basket resembles last week’s, albeit with watermelon replacing canteloupe and beets and turnips replacing carrots. In closing, a quick reminder that we are taking orders for garlic (at $10 per pound) as well as for Italian (paste) tomatoes (at $20 dollars for a 20-lb box). You may place your orders here. This week’s note is purely informational. It features two vegetables, garlic and Italian, or paste, tomatoes. This year’s garlic harvest has been particularly good. It may be due to the abundance of sunshine this summer, or the mild winter last year, or a combination of both – whatever it is, this year’s crop has withstood the vicissitudes of weather and preying insects. The bulbs are beautiful and we aim to include some in your baskets over the next few weeks. 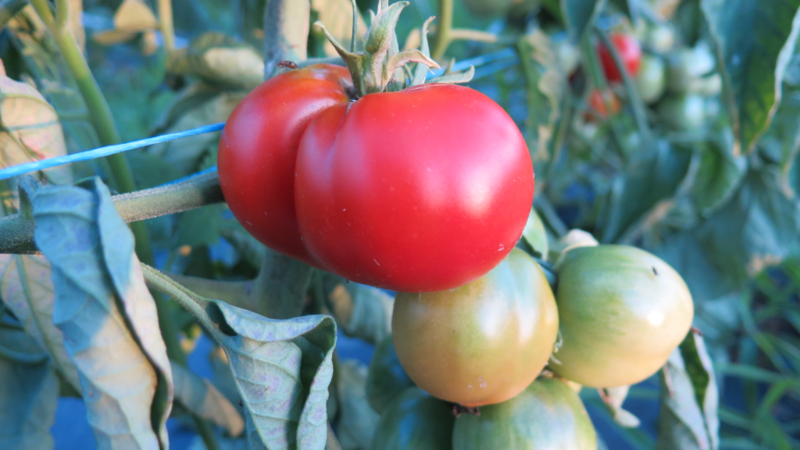 In a similar vein, we produce two varieties of plum tomatoes for sauces and cannning: Roma and Amish Paste. Roma is your classic plum tomato; Amish Paste is equally fleshy and tasty, but comes in a larger format. As an aside, for those of you looking for dill flowers for pickling, let us know so we can include it as an herb in your baskets. Also, beginning in September, we will begin to include potatoes in your baskets. For logistical reasons (equipment constraints, mostly), we do not grow our own potatoes. However, our supplier is a great producer of organic potatoes – Réal Samson, and his son, Gabriel, in nearby Farnham. They produce red, white and yellow potatoes. You can expect to see their product in your baskets every other week this fall. That’s it in terms of public interest announcements this week. We rarely see sunflower fields in these here parts, but the one I saw stretched on forever, a glorious sea of sun-drenched and windblown bobbing heads. Indeed, such a rare occurrence warrants a roadside halt, a determined effort to pause and absorb the visual and sensational overload. In fact, I stopped more than once – only to realize that the flowers seemed equally determined to ignore my admiring gaze, stubbornly turned ever eastward no matter the time of day or the position of the sun. Why the cold shoulder? I found myself wondering. My understanding has always been that sunflowers follow the sun in its daily trek across the sky – from east to west (‘tournesol’). In fact, a timely article in Le Monde reports that scientists (experts in sunflowers, among other things) have observed the following: while the young sunflower bud does indeed follow the sun as it crosses the sky, the mature blossom stands obstinately immobile, facing eastward. The article then waxes lyrical on the subject of circadian rhythms, heliotropism and biological clocks, culminating in the realization that a fixed eastward orientation attracts far more pollinators than an east-to-west sweep. Mother Nature really does know best. Yet she can also be a harsh and unforgiving mistress, as we’ve witnessed with the heat wave of the past two weeks. I won’t even mention the amount of work that has gone into irrigating entire vegetable beds by watering can, with water hauled from our depleting pond in large barrels — a critical task as the very survival of the new transplants that are to grow into the vegetables that we shall be serving up this fall hung in the balance. That said, the forecast is for rain this weekend. Hope springs eternal, we shall see. Meanwhile, the seasonal abundance continues and your baskets will be full. And while not everyone will have blueberries this week, cantaloupe season has begun…We look forward to seeing you all again and remind you that the bakers (and your bread) are back. 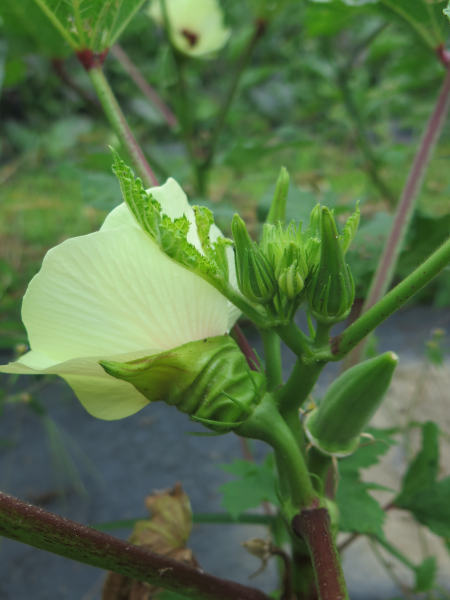 The plant is sturdy, its flowers are beautiful “and yet, and yet,” as Aznavour would say, its fruit repugns: I speak of okra, a vegetable of discord if ever there were one. I feel compelled to try to set the record straight, as this little-known but much maligned vegetable – in North America, Cajun Louisiana excepted – is greatly appreciated just about everywhere else in the world. Why such ill-repute in our climes, I wonder? It’s slimy, some say, …”more slippery than a banana peel!” Perhaps, but the trick lies in its preparation. I should start from the very beginning: its scientific name is Abelmoschus Esculentum. A member of the hibiscus family, its flower is striking, in terms of both its colour and its shape. 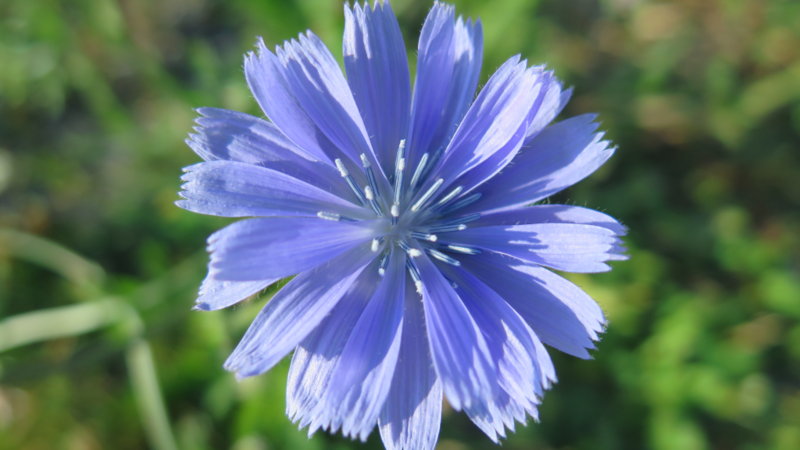 It is from this flower that the vegetable emerges, seeming to consume itself as it grows. As soon as the vegetable appears, it must be checked frequently. Harvesting it too late (too big) means it is no longer edible; harvesting it too early (too small) means we would require acres and acres of the stuff, and a small army of harvesters as well. Okra is mucilaginous and works well as a natural thickener in soups and stews. When you cut it into pieces before cooking it, its gelatinous substance dissolves into your dish. If you bite into it raw, on the other hand, you feel a certain viscosity – something I find interesting, okra naysayers notwithstanding. There is a certain irony to such praise for a vegetable I serve so parsimoniously – like my eggs, some might say – on a first come, first serve basis. 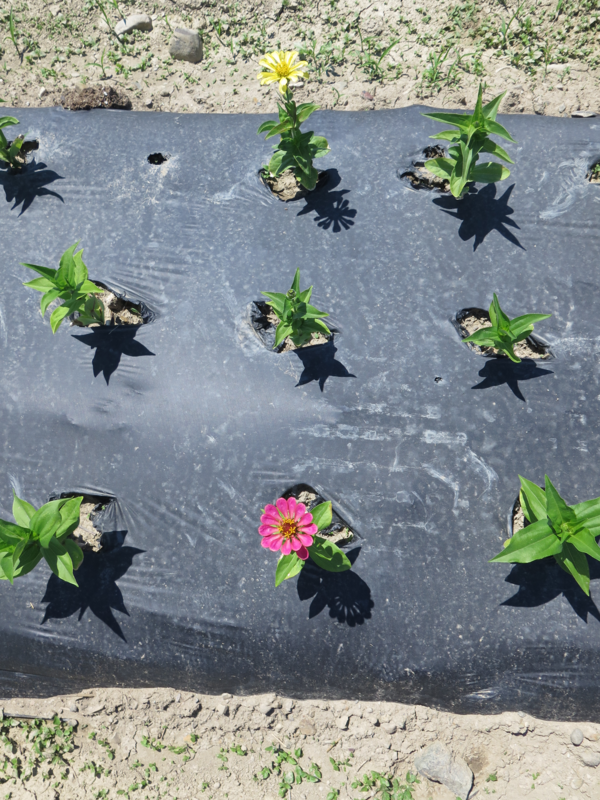 But it is impossible to harvest more or faster, as each plant yields no more than a single specimen a day. In closing and to the daring amongst you, note that we will be serving up okra in limited quantities over the next few weeks (see a couple of okra recipes here). Summer is in full swing at the farm, amidst alternating sunshine and rainfalls, just enough of the latter to tide the plants over to the next one. Last Friday I woke determined to do something both pleasant and useful – which explains why I spent the day harvesting garlic. Those of you who have been following us for a few years now know how much I love my garlic. It is both nourishment and medicine, ensuring sustenance and health. I will not dwell on its historical and cultural significance, but it is an essential ingredient in almost every culinary tradition. All the better, I say, and I trust that you will find the garlic in your baskets in coming weeks satisfyingly subtle and pleasantly unctuous. We were hoping to improve on the delivery dates for another banner crop – corn – but in the end, we will not be harvesting our first ears until next week. That said, we know it’s almost ready: two more raccoons have fallen for the bait in our cornfield traps and been discretely spirited away to wooded areas some 20 kilometers from the farm. We wouldn’t wish them on anyone else, but we do want to make very sure they don’t come back! So, in your baskets this week: a cornucopia of summer vegetables to complement your leafy greens, and a second week of blueberries. They’ve had some time to sweeten – we’re even more eager to share them with you than last week’s batch. There’s no dearth of topics to write about this week, more so now that the transition towards summer is complete. How do we know, you may ask? Well, being able to harvest all our nightshades in one fell swoop is a first telltale sign. A second one is our impending corn harvest, courtesy of the warmer weather we’ve been having. It is almost ready, as confirmed by two skunks and two raccoons, caught in our carefully placed traps, baited by pungent Portuguese sardines (admittedly, organic cauliflower would not have the same effect! )…Another sure sign of summer’s folly is the accelerating march of the weeds – prêle des champs (horsetail), crabgrass, golden rod – flowering perennials all, whose raison d’être generally escapes us even as we grudgingly admire their floral diversity while girding ourselves to do battle with them. The battle is more of a war which the weeds win – always. 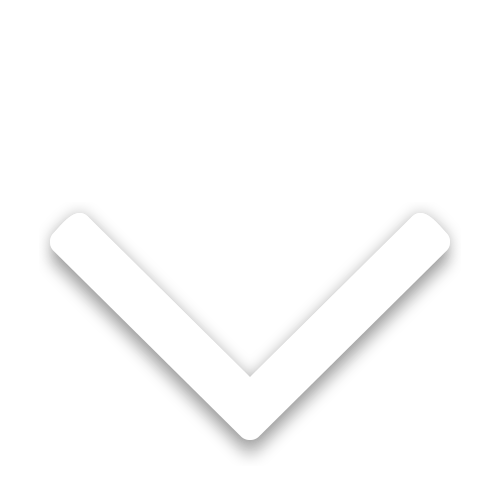 They are here to stay – vigorous symbols of plurality and nature’s right to exist. Our surrendering is continuous, no white flag is necessary given the gentleman’s agreement which governs our coexistence season after season. This week’s basket is an ode to squash in all shapes and sizes. Do not let yourselves be overwhelmed by their variety – rather, revel in it. The gastronomical options range from grilled (all), to steamed (summer squash) to stuffed (Lebanese zucchini and rondes de Nice). 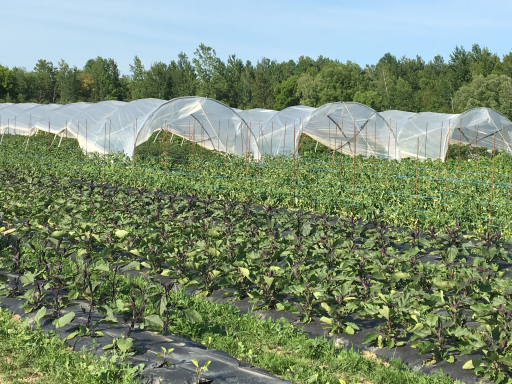 Cucumbers will be making their first appearance, as will our early blueberries (they will be followed by mid- and late-season varieties over the next 3 to 4 weeks). 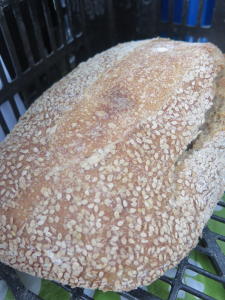 The bakers at Capitaine Levain remind you that your breads will await you at your respective drop-off locations for the next two weeks, followed by a one-week hiatus the week of August 5th. See you soon. The rainy weekend appeased the (good) spirits of the farm. Grey skies, cool weather and steady rain left the fields well-soaked. While those who toil in office towers cursed and appealed to the absent sun, we found the relief from sun-drenched cloudless blue skies refreshing, both literally and figuratively speaking, as we toured our fields in our rainboots. We are told that this cycle – 2 weeks of sunshine followed by 2 days of rain – is par for the course in an El Niño year. We are also told that its opposite, La Niña, is about to begin. We don’t want to taunt the (evil) spirits into fulfilling the prophecy, but forecasts are for impending cooler and wetter weather from the Pacific Northwest all the way across to the Northeastern states and Eastern Canada…not exactly what one thinks of as lazy summer days. I can’t help being a Cassandra (it’s in my farmer’s nature), but I’ll cease and desist for the time being – and enjoy what Mother Nature has to offer now. 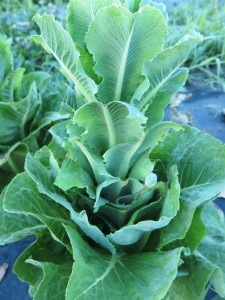 Those of you beginning to tire of all the cud-chewing occurring in your city and country kitchens will no doubt be relieved to hear that our entire bed of romaine lettuce, suffocating in the heat these last few days, has gone to seed…so the greens will be fewer. Time to get down and talk zucchini…as we head into the harvest of that singular vegetable, known for both its prolificity and, according to some zucchini naysayers, insipidity. Don’t get me wrong: I love zucchini, the very foundation of Mediterranean, dare I say global, cuisine. The plant is vigorous, stocky, even, with broad-leaved stems reaching heavenwards. The flowers are a deep yellow, a beacon for bees, of both the ordinary and bumble variety. 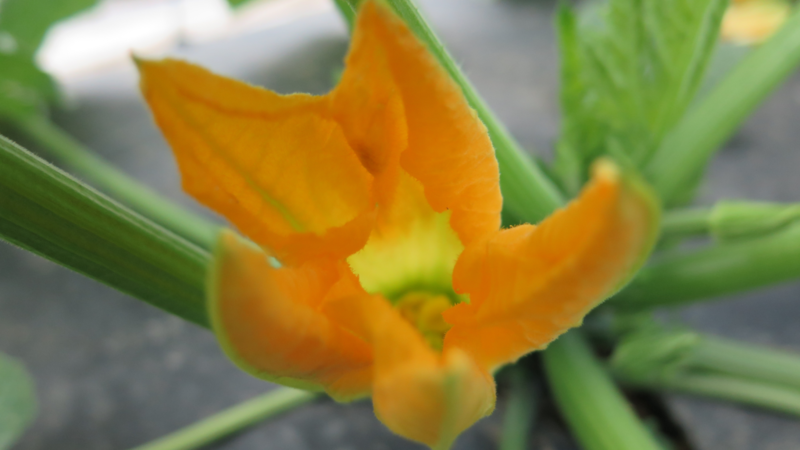 For three weeks, the zucchini plant produces flowers, both male and female, that engage in a balletic exchange of pollen, ensuring the survival of the species. Every once in a while, though, especially early on, they misstep, and the misshapen fruit that results rots quickly, dying an untimely vegetable death on the plant. Mother Nature may seem cruel, but when survival of the species is at stake, mercifulness is not an option. This week’s basket signals a transition: goodbye strawberries and garlic scapes, hello Chinese cabbage and fennel. Impending changes notwithstanding, we’ll be sure to keep you well-stocked on the greens front – serving up more lettuce and other leaves. 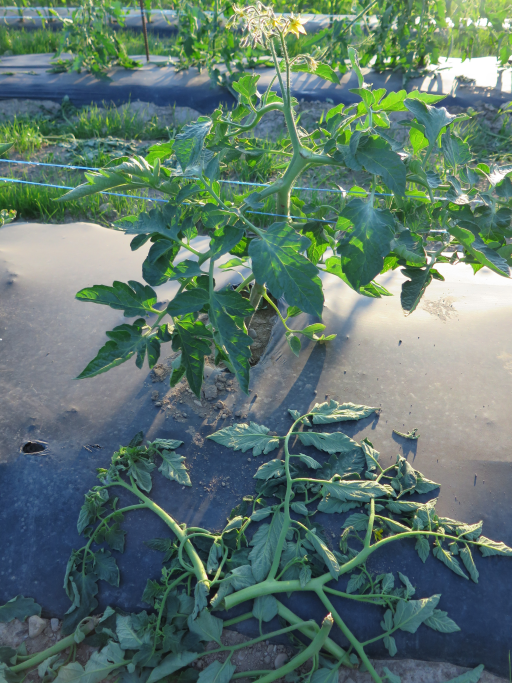 We don’t want to jinx it, but our early tomato crop is looking promising…with harvesting of saladettes (sic) to begin soon, perhaps as early as next week. I’m keeping my fingers crossed — there will be no turning back once our tomatoes arrive, the surest sign of summer ever. Bread news: responding to your input, Céline and Ghislain have expanded their offering to include a basic sourdough option, or pain de campagne, available in their one-, two- or three-bread(s) weekly basket formats – check it out here. Otherwise, you know the drill: please don’t forget your empty egg cartons and berry pints. We look forward to seeing you all again shortly. It’s old news already, but this week was another hot one. We’re getting used to it. The strawberries seem to appreciate the heat, and even some of the brassicas are loving it, particularly the broccoli which we had to harvest hastily, given the searing temperatures over the long weekend. Broccoli is an under-appreciated vegetable if ever there was one – if you only knew the attention it requires, you would swallow it whole. Much-loved by the aptly-name flea beetle (a small but noxious bug), broccoli requires protective netting, compost-rich soil, buckets of water and lots of attention to ensure it doesn’t bolt. In just a few days, the farm has moved from spring to summer as the nightshades (solanaceas) and corn have gone from a vegetative state to flowering and tasseling. Even the weeds are growing like gang-busters, strips of rambunctious greens that are a constant source of angst for those tasked with keeping them in check. Weeds are a topic we will return to anon – at once abhorred and awe-inspiring, they are as indicative of the health of a field as the vegetables they compete with. Finally, a few logistical notes: Ghislain and Céline, the bakers at Capitaine Levain, will begin delivery of their bread baskets this week to those of you who have signed up. Hurry up and register if you are interested in testing the concept. Also, we will gladly take empty egg cartons and berry pints (the little red boxes). Finally, please remember to bring your own bags for your vegetables. We look forward to seeing you all again. At 33 degrees Celsius in our fields and 37 degrees Celsius in our greenhouses, this heat wave is sparing no one, particularly on the vegetable front. If it’s a harbinger what’s still to come, we’ll have to steel ourselves and revise our seasonal litany of prayers. I may move to incantations, or consider reciting a poem or two – something along the lines of Théophile Gautier’s Pluie, for example. Fortunately, even as I write this, the sky is darkening and the wind is turning. Come what may – rain or hail – it will be welcome. We need a bit of H2O, and fast. Indeed, as you may already have surmised, we irrigated quite a bit this past week — our pond has never been so low so early in the season. That said, our veggies have stocked up on sunshine over the past week. The lettuce is succulent, the strawberries are ripe. The zucchini plants have begun to bloom, we should see our first zucchinis in a couple of weeks. This week’s offering includes garlic scapes and kohlrabi. Some will venture that the garlic scape trumps its other, less subtle, half – the garlic bulb – but I refuse to take sides in this debate. Insofar as kohlrabi (the German version of chou rave, which carries over into English) is concerned, it is best eaten fresh, sliced in sticks with a dip of your liking, or served up as a slaw.